What is the GATE® (Gifted and Talented Education) Program? The Gifted and Talented Education (GATE) or Talented and Gifted (TAG) is a specialized program many schools offer that uses a specialized accelerated curriculum designed challenge students that have demonstrated a higher level of thinking and a capacity to evaluate and analyze specialized subject matter relative to their class-mates. 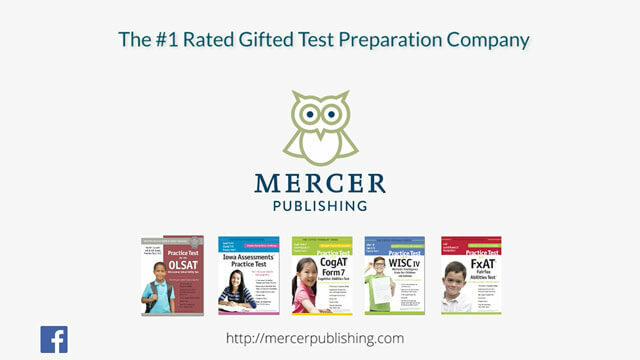 Watch our video to learn more about Mercer Publishing’s Gifted and Talented Test preparation system. How are students Identified for GATE/TAG programs? The three most common tests for evaluating a students’ abilities to solve problems and evaluate information are the CogAT®, NNAT3®, and OLSAT® abilities exams. The question types on these tests are different from the standard achievement tests most students are used to. Many school districts are also now requiring the Iowa Assessments exam in addition to these abilities tests so that they can assess how well a child is doing in their grade level academics. Admission into a schools GATE program may require minimum scores on all 3 tests or a combined minimum score. For question types and examples please view our sample questions for these tests. How do students prepare for these tests? To assess how well a student will do on these tests and to uncover any areas that a student may need to spend extra time on before the actual exam, Mercer Publishing offers the #1 full-length practice test for the CogAT, NNAT3, OLSAT, and Iowa Assessments exams. We have found that practicing the exact question types your child will see on these test is the best way to prepare them for what they will see on the day of the test. Our practice tests are full-length practice tests and offer grade specific questions in the same format as the actual exam. If you have additional questions, please feel free to visit our FAQ pages for the CogAT, NNAT3, and Iowa Assessments exams. To begin preparing your child for success, click on the relevant grade level to view our selection of grade specific practice tests and materials.